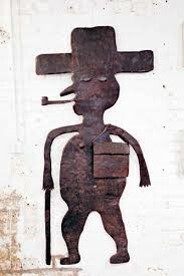 Haitian metal art has become even more popular in the last few years with the growing interest in Fair Trade. After the 2010 earthquake that rocked Haiti to its core, Haitians leaned on their heritage to help rebuild their lives. Creating beautiful handcrafted gifts like the Haitian metal art has been instrumental in the rebirth of Haiti. How did Haitian Metal Art get its start? In the 1950’s a railway mechanic working in the Dominican Republic, Georges Liautaud (born 1899), decided it was time to go back to his home village, Croix des Bouquets, Haiti, to spend his last few remaining years near those he loved. The average life expectancy in Haiti at the time was 56 years. When Liautaud returned, he found that, indeed, many of his friends and family had passed on to the next life. He began to honor them by carving elaborate crosses for their burial sites out of iron, his material of choice from his train-repairing days. 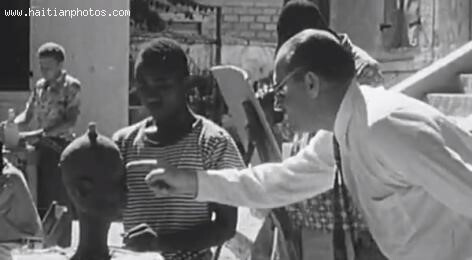 Shortly before this time Dewitt Peters, an American Quaker pacifist, traveled to Haiti to teach English. 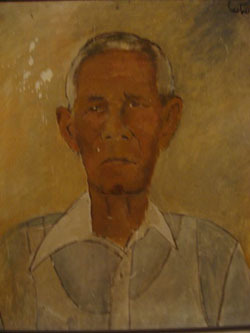 A watercolorist himself, he recognized the extraordinary artistic talent of many Haitians but the lack of organized support for the artistic community. In partnership with the Haitian-American Institute and alongside several dedicated Haitian artists, Peters established Le Centre D’Art in Port au Prince in 1944 with the purpose of identifying and encouraging Haitian artists, giving them a central home to explore and develop their talent. Peters also scoured the countryside, looking for artists. It was on a visit to Croix des Bouquets that he came upon the extraordinary crosses dotting the cemetery. Learning of the creator, a friendship emerged with Peters encouraging Liautaud to expand his artistic themes. A devout Catholic Vodun, Liautaud began creating sculptures in homage to different lao (spirits from the Voodoo religion – more about that in another blog). His talent quickly became revered at Centre D’Art and his works would eventually find their home in some of the most prestigious museums around the world. Liautaud worked tirelessly at his new-found technique. Peters then began to encourage Liautaud to teach others this new art form. 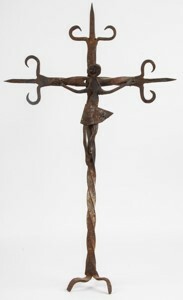 Having traveled around the world, with a passion for indigenous art, Peters recognized that the metal art Liautaud was creating was unique to anything else he had seen. Others needed to carry on – and expand the Haitian metal art form. Murat Brierre was Liautaud’s first disciple. Then Liautaud taught his neighbors, the brothers Janvier and Seresier Louisjuste to cut the metal (fer découpé as it’s known in Haitian Creole). Today, when we visit Croix des Bouquets the artists proudly tell of their master, the one who trained them in the art. Apprenticeship continues to be a hallmark of the Haitian metal art discipline. Georges Liautaud would live the rest of his life in his home village of Croix des Bouquets, always creating art, teaching others until his death in 1991 at the age of 92. Many things inspire us about this story – but most of all we are humbled by one man who had a talent, honored and worked for the service of this gift, shared it with others and because of that a whole cadre of artists have emerged, providing food, shelter, schooling for a village in an extremely economically poor country, albeit rich in culture and spirit. May we all learn and so live.